I don't do resolutions in real life, but over at our gaming podcast, Gamerstable we do an annual resolutions and challenges episode. Check it out! Maybe you'll get some ideas to spice up your own gaming lifestyle. 1. Continue with my Five Reasons to Visit series. I'm having fun with this informative series. Should be an easy project to carry on since it's already started. 2. Try to do a few more Ring of Five Questions interviews. I have a very short list of some good candidates. I just need to get back in the groove. 3. Compile Castle Greyhawk webcomic chapters 1-3 into PDFs. Should be easy, but do I have the software to make it look nice? 4. Create another regular Greyhawkery feature. Since Greyhawk news and events is few and far between, creating content is always a struggle. I am open to suggestions for new blog content. What sort of things subjects should I cover or start focusing on? 5. Social media increase? I know the Thursday night Greychats have pretty much faded into undeath, so I'd have to assume I can reach more Greyhawk fans if I start to focus more on Facebook (ugh) or maybe create a Greyhawk-centric Twitter account? 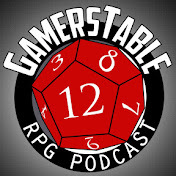 I already have a Twitter for my podcast group @GamersTableMike so maybe all I need to do is start tagging Greyhawk posts? That's all for now. Hopefully more comics and Greyhawk visiting next time! Welcome back, lords of the World of Greyhawk as I once again enthrall you with my ongoing feature titled "5 Reasons to Visit...". If you haven't seen my overviews of the Bandit Kingdoms , Great Kingdom or Furyondy, be sure to check them out. People who have played D&D should at least know the classic adventures of Greyhawk and hopefully, many of you also know the setting's esoteric material. With 5 Reasons I seek to put a spotlight on five good plots and places in (ideally) each of the nations of the Flanaess. Perhaps a new DM will be intrigued by these locations or an experienced one will be reminded or inspired to revisit these areas. As always, comments, suggestions and additions are appreciated. Enjoy! 1. Saltmarsh: The classic intro adventure U1: The Sinister Secret of Saltmarsh is a seminal work in the history of D&D. Placed on the fringe of the kingdom, this cozy town is an excellent place to launch a small regional campaign. The module is a haunted house mystery that then spins off into further adventures. The town of Saltmarsh itself has a notable character, and it got further development in a 3.5's Dungeon Master Guide II. 2. Gradsul: If a DM wants to run a larger Keoland campaign that is urban or perhaps even sea-based, why not have both? The perfect place for you is Gradsul, the most populous (49,400) city in all the kingdom. The "Haven of the Suel" is an ancient city ruled by House Rhola and sits at the mouth of the mighty Sheldomar River on the western Azure Sea. 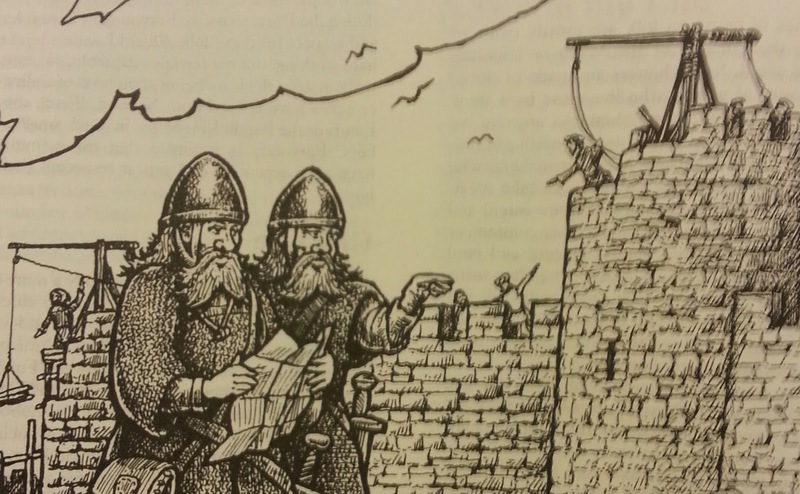 First detailed in Living Greyhawk Journal #1, there is a lot going on in Gradsul. The city is mercantile, cosmopolitan and well defended; it's focus was once on exploring the south seas and jungles. 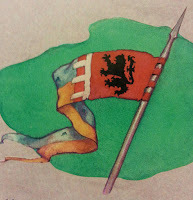 Since the Greyhawk Wars however, the threat of the Scarlet Brotherhood keeps Gradsul's navy on alert. Gradsul is friendly to free-wizards (unlike the rest of Keoland) with a guild of Sea Mages supported by the legendary arch-mage Drawmij. There is also plenty of thievely work to be done in this wealthy city, or maybe you have a fighter who'd like to join the Knights of the Watch whom are found in great numbers. As a base of operations, Gradsul is centrally located for adventures striking out in all directions such as east across the high seas, to the west within the ominous Dreadwood, south to the Hool Marshes or farther inland where courtly intrigue and knightly quests await. 3. The Silent Tower: Speaking of free-mages, their antithesis in Keoland is an order of sorcerers called the Silent Ones. Detailed in Living Greyhawk Journal #4, the Silent One's tower dates back to the earliest origins of the kingdom, jutting from the plains 25 miles south of the capital city of Niole Dra. The sorcerers of the tower are only ruled in name by the Lion Throne of Keoland, though they do serve as tutors and advisers to their nobility. Uhas of Neheli famed for penning the Chronicle of Secret Times, is said to once be part of this order long ago. The leader of the Silent Tower however, is The Wyrd, Mohrgyr the Old, an ancient man with a dubious past. The blue-gray Silent Tower is clearly visible for many miles around and is easily three times higher than any tower in the kingdom and holds numerous dungeon levels as well. The Silent Ones main purpose is to bury or keep secret any magic that may be harmful to the Sheldomar Valley (such as lore concerning Vecna). With so many lost relics, artifacts and books hid in their vaults, the Silent Tower is therefore the Greyhawk equivalent of Area 51. The Silent Ones' practices have made them enemies however. The Seekers are an adventuring society who want to uncover lost lore for profit; notably the outcast Eli Tomorast is the worst of their lot. Then there's the Scarlet Brotherhood who are always interested in the secrets of their Suel heritage. Where do the PCs fall into this mix? Well they could serve either side by retrieving magic before the other, or they could be real greedy and try to break into the Silent Tower's Sanctum Maleficarum for a handful of major artifacts. Trying to raid a dragon's hoard might be easier! 4. Hool Marshes: If cities and sorcerers aren't your thing, there is the Hool Marshes. These marshes form a natural border between Keoland and the Hold of the Sea Princes to the south. Surprisingly this wetland is a hotbed of published adventures. The sequels to Saltmarsh, U2: Danger at Dunwater and U3: The Final Enemy are set here. For more scaly threats, the generic AD&D module I2: Tomb of the Lizard King was retroactively placed in Keoland in the County of Eor. And lastly, another generic adventure, I7: Baltron's Beacon can be found in the depths of the Hool Marsh, its ghastly green glow a warning to foolish heroes. Beyond these published modules, the Hool is a vast tract of swamp that can support hidden cults, bandit hideouts and other abandoned edifices from past imperial expansions. 5. Dreadwood: Lastly is the dense forest that dominates southern Keoland, aptly named the Dreadwood. The edges are ruled by tribes of elves, noble woodsmen, druids, haughty wizards and the like, but within the Dreadwood "preserve" is the real dangers. These good residents of the forest must constantly contend with incursions of humanoids and monsters from the deepest parts of the Dreadwood. Some rumors persist there's even an elder green wyrm within the Dreadwood. If PCs are looking for a good hack and slash wilderness romp the Dreadwood might be a good outlet for them. 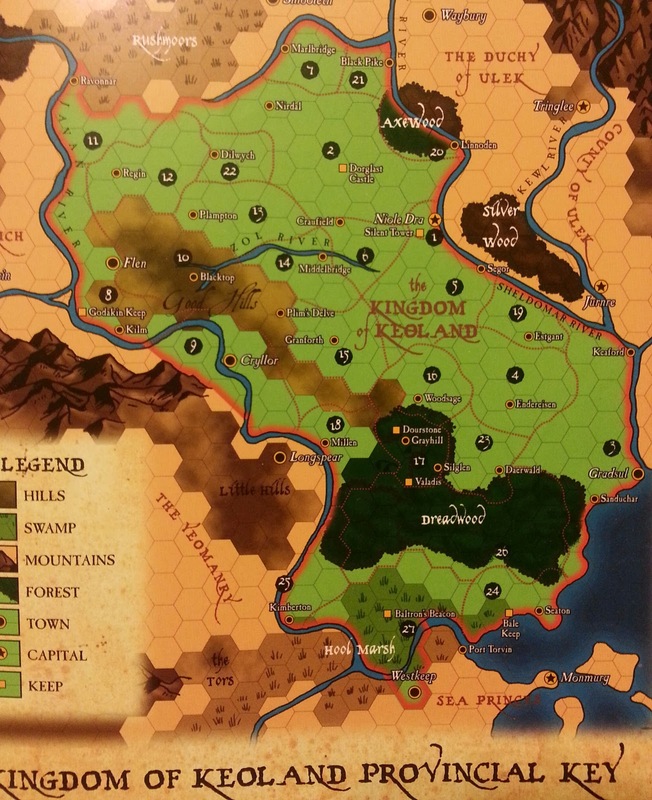 For more information and adventures set within the Kingdom of Keoland, checkout the ongoing tales that began in Living Greyhawk over at Greyhawk Reborn - coming to a convention near you! 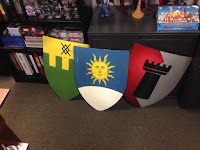 I'm sure by now most Greyhawk users on Twitter like myself have seen Mike Mearl's teaser pic of some full-sized shields he had made with Greyhawk heraldry painted on them. Talk about a cool Christmas present! I wish I had thought of that now. 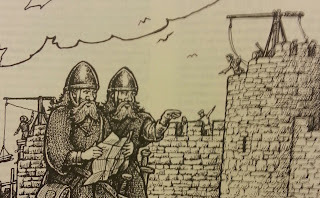 The nations represented, left to right, are Onnwal, Sunndi and Bissel. Since Mearls had these delivered to WotC, rampant speculation will occur, but I'm not biting this time. All I want to know is who did those and where can I get one made of Ull? Well met Greyhawkers! It may be Star Wars week around the world, but today I'm proud to promote the 100th EPISODE of our ongoing Castle Greyhawk graphic novel. Check out page thirty-three to see some incredible visuals dreamed up by Scott Casper. On our site you can also check the archives and follow the entire Castle Greyhawk story from the very beginning. Artist's Commentary: Well folks, this milestone page was difficulty 9/10 for me. Dragons and webbing is a lot of work and this took me three sketch runs to get it halfway right looking to my eye. The last panel was particularly good in my opinion. The dragon looks angry and frustrated. I like the variation in webs too, some thick, some wispy, some broken free. A lot going there. The easiest part of illustrating it was Serten whacking the tail with his mace. That little "crunching" attack makes made laugh cause I imagined this in game terms; a cleric putting all he has into a swing and at best has a 50% chance of hitting, then perhaps only doing about 8 hp damage (magic mace? dunno). The white dragon obviously felt it, but I'm sure it was a distraction for Tenser to get away more than a lethal attack. Aww yes! The only thing I love more than Greyhawk...Star Wars is almost here! Punch it! Welcome stalwart fans of the World of Greyhawk as I continue my ongoing feature titled "5 Reasons to Visit...". If you haven't seen my overviews of the Bandit Kingdoms and the Great Kingdom check them out now. Again, for people who have played D&D you should at least be familiar with the classic adventures set in Greyhawk and possibly, some of you also know the setting's gritty details. With 5 Reasons I seek to put a spotlight on five good plots and places in (ideally) each of the nations of the Flanaess. Perhaps a new DM will be intrigued by these locations or an experienced one will be reminded or inspired to revisit these areas. As always, comments, suggestions and additions are appreciated. Enjoy! 1. 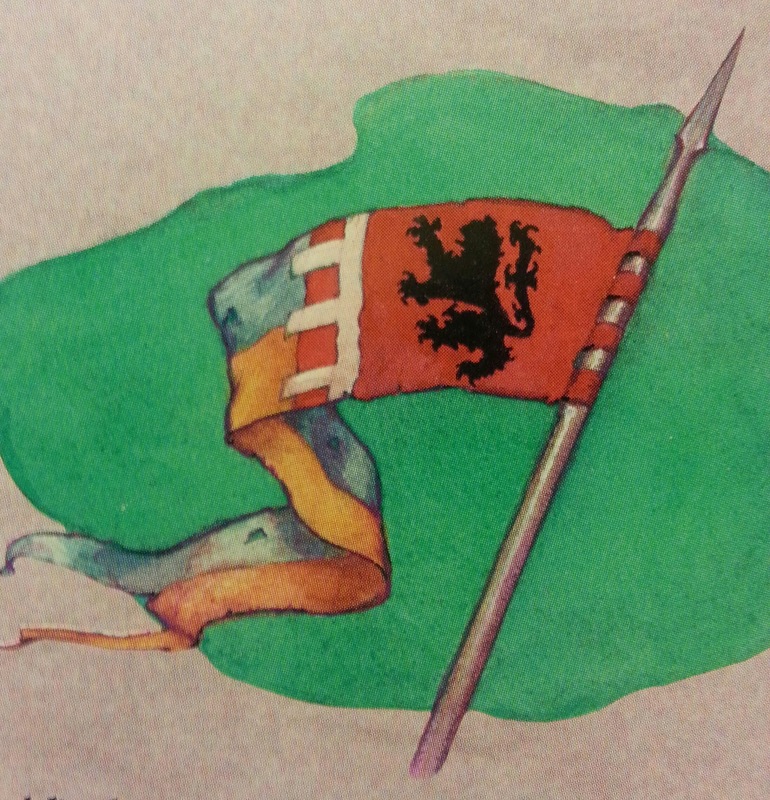 Castle Ehlenestra: The first thing you should think of when contemplating the Kingdom of Furyondy is knights. The three branches of the Knights of the Hart figure prominently in all the history , politics and adventures based around this land (such as the crusade on the Temple of Elemental Evil by Prince Thrommel). One castle dedicated to this order, Castle Ehlenestra, stands out from the rest. Named for the elven goddess Ehlonna, this castle is first mentioned in the sourcebook The Marklands, Ehlenestra sits is at the western edge of the kingdom and is home to Sharnalem, a ranger swanmay Knight of the Hart who trains tyrgs to hunt down goblinoids. More unusual than it's owner, the internal castle is made of wood, surrounded by a stone wall. Furthermore, there is a walled forest preserve where Sharnalem's sylvan allies such as brownies and beastmen. Castle Ehlenestra is undoubtedly a safe-zone for PCs; a place to seek wisdom, healing and strength before tackling the forces of evil abroad. 2. 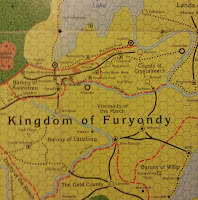 The Flare Line: The second thing to know about Furyondy is that it has been in a state of war with the Empire of Iuz for decades, and during the Greyhawk Wars era, Iuz the Evil advanced by conquering the northern tip of the kingdom. This led to a no-man's land running from Ehlenestra in the west all the way to the town of Morsten on the Veng River to the east. 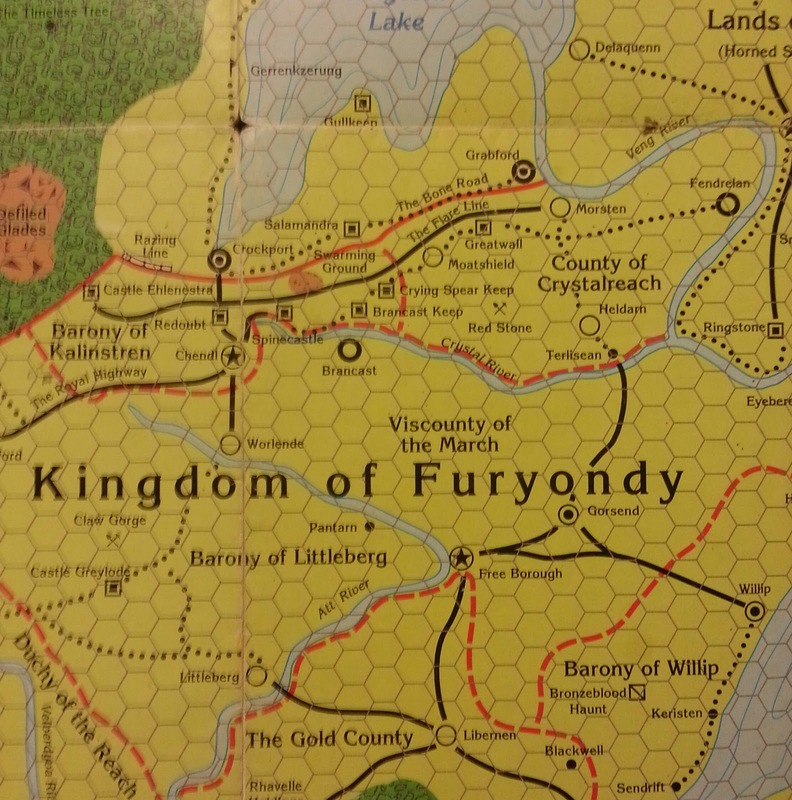 Along this war-front is the road called the Flare Line where Furyondy's barons and counts are building defenses against Iuz's undead and humanoid hordes. This is an area of tense standoffs, daring sorties and spying missions. The adventure Border Watch is a nice low-level intro to this theater of war. Other hot spots along the Flare Line include the Razing Line a strip of land west of Crockport where Iuz's magicians have despoiled and desecrated the ground making it the perfect place to animate dead. Then there is the Swarming Ground where fort construction is hazardous because the area is infested with Giant Ant Lions. Enterprising DMs could create an entire campaign centered just on this line of defenses and holding them against the tide of evil. 3. Bronzeblood Haunt: The Kingdom of Furyondy is a large, well-settled realm. As such most dangers here come from without (namely Iuz or the Horned Society). There is exceptions however, like the ruins of a castle referred to as Bronzeblood Haunt. Long ago there was a sadistic noble who rumor says consorted with cults and vampires. It became so bad that King Thrommel I had this ruler deposed and his castle reduced to rubble. The entire area unfortunately still has an aura of evil with mysterious mists and unnaturally blood red trees during autumn, No hero to this day has been brave enough to get within miles of this ruin's dungeon to search for whatever was left behind. Bronzeblood Haunt is a perfect opportunity for a DM to create their own old-school dungeon in a location far-removed from most other famous modules and the meta-plot of war in the north. 4. Claw Gorge: Another area of danger within Furyondy's borders is the quarry named Claw Gorge. Located in the west near Castle Greylode, Claw Gorge is vital to the kingdom for its limestone and is worked by a community of gnomes. The rift however, has recently come into trouble as the miners hit upon pockets of corrosive gasses and tunnel complexes where frequent encounters have occurred with monsters such as cave fishers, a behir or worse. Rumors say the mines are cursed or that agents of Iuz have summoned the monsters here. Either way, Claw Gorge is a good place to send characters who are just looking for a break from Furyondy's political-war drama to do some good old fashioned hack and slash action. 5. Chendl: Lastly is the capital of Furyondy, Chendl. This planned city of 15,600 (at it's height) was first detailed and mapped out in the module Fate of Istus, with more recent updates for the wars found in The Marklands. Chendl once boasted to be the most extravagant city in all the Flanaess due to its grand temples and palace, broad avenues and gardens, and its signature feature, a system of canals plied by gondolas (think Venice but inland). All the beauty was smashed during the wars however as Chendl became under siege by the forces of Iuz. During this era (until Belvor IV's counter-crusade) the city is half demolished and every person of worth is rallied to the defense. While all looks grim for Furyondy's capital, the haughty aristocracy still maintains their high society lives, unabashed by the threats outside or the plight of their own people fighting for them. When running PCs thru this city think the desperation of Minas Tirith, but much less defensible. This can be the launching pad for a series of Furyondy adventures including all the above or perhaps the climax to a story arc leading to the retreat of evil. Welcome back loyal Greyhawk readers! It's the weekend and time to promote the third chapter of our ongoing Castle Greyhawk graphic novel. Check out page thirty-two plus follow some riveting writings by the director, Scott Casper. On our site you can also check the archives and follow the entire Castle Greyhawk story from the very beginning. Artist's Commentary: The spell slots are flying now! Last page, the whole party was getting knocked around pretty good so it's no surprise now that we have an enraged white dragon, the casters are on the defense now. I mention the spells flying because the floating magic script has been an ever-present effect in our tale and when those are added to other visuals such as a glowing daggers, arch-ways or McFarlandesque ropy strands, they should give the readers more than a clue what is being cast. It's a fun exercise in comic storytelling. Welcome back fellow fans of the World of Greyhawk today I continue my newest feature titled "5 Reasons to Visit...". As I stated last time in my survey of the Bandit Kingdoms, most people who have played D&D for a long time will at least be familiar with the classic sites of Greyhawk and some may even know the minutiae of the setting like myself. With 5 Reasons I seek to put a spotlight on five good plots and places in (ideally) each of the nations of the Flanaess. Perhaps a new DM will be intrigued by these locations or an experienced one will be reminded or inspired to revisit these areas. Naturally, all comments, suggestions and additions are appreciated. Enjoy! 1. Undead and Fiends: The Great Kingdom (in particular the central lands directly ruled by the mad Overking Ivid V and his relatives) is home to a dizzying array of undead and fiendish characters. There is the Demonic Knights of Doom first detailed in Dragon #59. These golden armored knights are actually enchanted with fiendish powers and weapons beyond normal men. Utterly loyal to Ivid and archmage Xaene their creator, the formidable Knights of Doom lead regiments such as the mounted "Bolters", heavy-foot "Howlers" and mounted-archer "Pointers". Beyond these terrors is the Death Knights, created by the demon-prince Demogorgon from the old order of the Knight Protectors. Many of these undead knights are major villains in their own right and pay no heed to Ivid. Furthermore, Ivid V and his fell priests of Hextor created the undead Animus to instill greater loyalty in his nobiles and commanders. Not as strong as a lich or a death knight, these undead are still highly intelligent and powerful in many unique ways. Lastly, due to the diabolical magic at Ivid's disposal, even his personal Companion Guard is said to have fiends among their ranks. 2. Rauxes: The capital of the Great Kingdom of Aerdy for centuries, was Rauxes. This city has undergone many changes in just the last few decades of Greyhawk publication history and all are quite suitable for a campaign built on tyrannical intrigue, high magic and impending warfare (see the free PDF, Ivid the Undying). The Rauxes seen in the module Fate of Istus (with a decent map) once had a lofty population of 41,000 but the brutal rule of Ivid brought this number down to 35,000. By the time the Greyhawk Wars had concluded, Ivid's atrocities had reduced the city to about 22,000 that is until the city's ultimate ruination following the battle for succession of the Overking (see Living Greyhawk Gazetteer). Rauxes thus has a few eras that DMs can utilize for a long story arc of self-destruction, from once mighty imperial capital to a magically hazardous ruin where only treasure seekers now venture (I like to think of GW's skirmish game Mordheim). Rauxes is also home to a few arch-magi (Xaene, Karoolck, etc.) and artifacts of irredeemable evil. First and foremost is the fiend-seeing Malachite Throne, where the line of House Naelax sits (or used to pre-wars). It is also possible more than one of the Regalia of Might are found in Ivid's lands nevermind other relics of power mentioned below. Whatever era you play in, the fate of these high magic people and items is still entirely within the DM's hands to this day. 3. Dastryth and Errantkeep: These Naelax lands were probably once prosperous fiefs in the heart of the Great Kingdom, but in the post-wars era, they are now ruled by two deranged animus brothers, Darrien and Marinn. The two have a life long rivalry that continues in undeath with both turning all their remaining citizens into armies of zombies to continue their blood feud while they watch safely from their castles. This setting is a suitable gothic horror (or zombie survival) environment to have players wander into before encountering the hard stuff. The brothers are notable for their treasured magic tomes which would be highly prized by power players like the Circle of Eight or the Scarlet Brotherhood. 4. Permanence: Speaking of the hard stuff, there is the nearby castle named Permanence. This many turreted horror of leaning, twisted architecture is built on a slab of red rock and is home to one General Kalreth an animus warrior loyal to Ivid. Kalreth and his equally formidable lieutenant Balraize command a score of Doom Knights from this dubiously magical castle. What's most attractive about this castle for a high magic campaign is the lure of coveted banestones within its dungeons; magic stones which greatly aid in the enchantment and permanency of magic items. The trouble is, Kalreth hates wizards and will slay any who sets foot in Permanence with his dark artifact the Spear of Sorrow. Adventurers had better bring their A-game to this place. 5. Rifter: Near the capital is another interesting keep built by Ivid II as a fall-back point should Rauxes fall. This magically reinforced bastion is armed with an array of ballista plus a garrison of Companion Guard and Fiend-Knights as well. What is most hair-raising is that the bunker allegedly contains a Sphere of Annihilation and the famous Machine of Lum the Mad. Imagine the possibilities of breaking into or assaulting this small keep. Good luck!